We city folk may not be able to live without our 24-hour Duane Reades and hot bagels on demand, but that doesn’t mean we don’t sometimes dream of ditching it all in favor of a more bucolic existence. Fortunately, you can do that without giving up your lease: Lots of working New York state farms offer on-site lodging so you can learn about the harvest, get to know the animals or just sit down for a truly farm-to-table meal. And while you have the option to participate in farm chores, it’s not at all required. Whether you’re looking to get knee-deep in mud or simply recharge amid the rolling hillsides, you’ll find it on the farm. Supplying meat to butcher shops like Marlow & Daughters and the Meat Hook, Kinderhook is one of Brooklyn’s favorite resources for humanely raised, grass-fed and -finished animals. It also happens to be one of the Hudson Valley’s best-known farm stays since 2011. 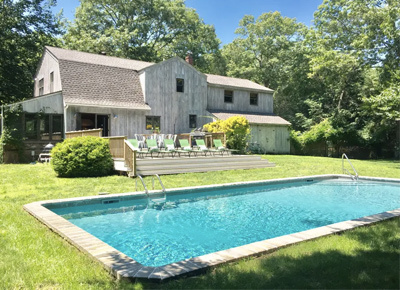 The “rustic yet elegant” barn is equipped with a full working kitchen, indoor plumbing, towels, linens and pillows, as well as a barbecue and outdoor dining area. Stock up for meals at the farm store, which offers beef, lamb, chicken, pork and eggs. Kinderhook is also very close to the town of Hudson, should you decide to go out to eat, but dinner on the farm at sunset is the move to make while staying here. Guests can help out with farm chores or join the free farm tour every Saturday and Sunday at 1 p.m. But no judgment if you’d rather enjoy the view from the hammock outside. FYI: There is no TV or Wi-Fi in the barn, so be prepared to hang IRL. For an adults-only escape, the farm stay at Little Ghent Farm is a recently renovated, open-plan studio apartment with plenty of natural light (read: excellent for Instagram), plus a full kitchen, wood stove, indoor plumbing and central heating. The farm store sells any provisions you might need; better yet, the team is happy to put together a welcome breakfast basket or a to-go dinner basket upon request. Hosts Mimi and Richard Beaven raise pigs and chickens on pasture and keep bees. Mimi also does all the cooking and baking for the kitchen and farm store (be sure to try her sourdough). Guests are encouraged to be interactive on the farm, even if it’s as simple as touring the grounds. For those who just want to dip a toe into farm life, consider attending one of the workshops this summer, including Food Photography and Styling this June. West of the Hudson River, in the Catskills foothills, Tom and Denise Warren have been running their family farm for 30 years. What started out as a second home became a full-time endeavor, and the Warrens are always busy working the farm with their two sons. The Farmhand Cabin, overlooking Kortright Creek, is for those who really want to try living off the land, with a compost toilet, solar shower, outdoor wash sink and no Wi-Fi. (The cabin does have electricity, an electric heater, a fridge, a microwave and a coffee maker, though.) Aside from lodging and beautiful views, the farm also offers field and kitchen workshops, including a tabletop “tour” of regional wine and cheese, as well as a butchering class. Agritourism novices should consider the “Tour and Chores” experience to spend a day learning what it’s like to be a farmer. Breakfast, private meals and basket meals are all available by request, so you can make your stay at Stone & Thistle as engaging or relaxing as you want it to be. Although hens and pigs can be found at this farm, the animals aren’t the main attraction. The farm stay at Hearty Roots—popular in NYC for its vegetable CSA—is in a gorgeously renovated 1820s farmhouse that offers direct access to a pick-your-own garden that’s only open to guests, at no additional charge. The 70-acre organic farm also has a farm store: You can even preorder vegetables, eggs and pork online and your food will be waiting for you in the fridge when you arrive. As with the other farms, the experience at Hearty Roots is customizable and can involve helping on the farm or not. A half-hour farm tour can be prearranged, and a winery and a distillery are both less than a mile down the road. Amenities include Wi-Fi, a full kitchen, a washer/dryer, a backyard, a patio, a grill, indoor plumbing, and heating and air conditioning. Notably, Hearty Roots’ farm stay is available year-round, thanks to the greenhouses that keep things growing through the winter. The third-generation farm in the western Catskills raises cows, pigs, sheep and chickens on pasture and also maintains a small organic vegetable garden. The farm stay housing is a platform tent with canopied ceilings, canvas walls and wooden floors. Though the word tent connotes “roughing it,” it’s much more comfortable than that: There’s plumbing, a full kitchen and a wood stove—and an open-air shower house steps away from the tents. Intentionally off-the-grid, the tents have no electricity or Wi-Fi, so be prepared to unplug. Prepared meals are available by request, or you can pick up your own supplies at the Stony Creek farm store, open every day from May through October. When you’re not cooking, you’ll want to spend your days hiking the rolling hills or swimming in the pond. Along with weekly farm tours (Saturdays at 11 a.m.), every Saturday night the farm hosts a pizza party using its very own outdoor brick oven, followed by a campfire. The farm is also hosting a yoga workshop this summer, led by Brooklyn-based yogi Kate Lynch.